Premier Kitchen & Bath – a company known for providing exceptional home renovation services – has served homeowners in Tempe, Arizona, and the surrounding communities since 1994. As a full-service design-build firm, our company provides a true red-carpet remodeling experience by guiding every project from concept to completion. 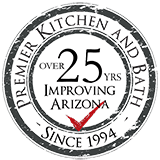 Premier Kitchen & Bath is proud to be the home renovation firm that homeowners in Tempe can trust for exceptional customer service, creative design, and quality workmanship. In fact, we maintain an A+ rating with the Better Business Bureau because we have an excellent reputation among our previous customers, and we have been named in Qualified Remodeler’s Top 500 list because of the quality of our services. Contact Premier Kitchen & Bath today for more information about the home renovation services that we provide. We proudly serve homeowners in Tempe, AZ, and the surrounding areas.